Bloom Time Late Summer and Fall. This clematis is prized for its vigorous nature and great flower power. 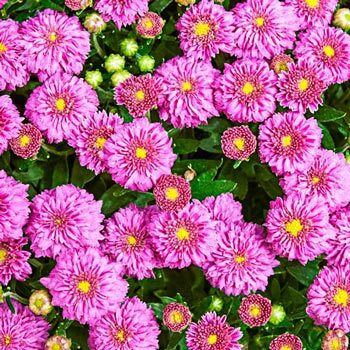 You'll love the abundance of satiny, mauve flowers that mature to pastel pink. Blooming in midsummer, they're accompanied by a light perfume, reminiscent of vanilla. This fragrance draws in butterflies and other beneficial pollinators, but won't attract any pests. Hungry deer and rabbits tend to steer clear. It's also resistant to the frustrating clematis disease, clematis wilt. 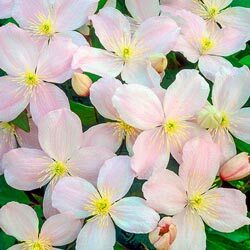 This perennial climber is hardy and easy to grow in many climates, a great choice for adding vertical interest in borders. Capable of growing an upwards of 20 feet, it's charming up the side of a house, and can be trained around fencing as a privacy screen. Foliage Type: Lobed green leaves form uniform rounded masses. Bloom Time: Late Summer and Fall.